In general Crow Canyon approver feature creates a task for approver and notifies with the link to edit form of the task so that Approver can set the decision and complete the approver task. If the approval feature is configured using Crow Canyon Advanced Approval App, then this article does not work. 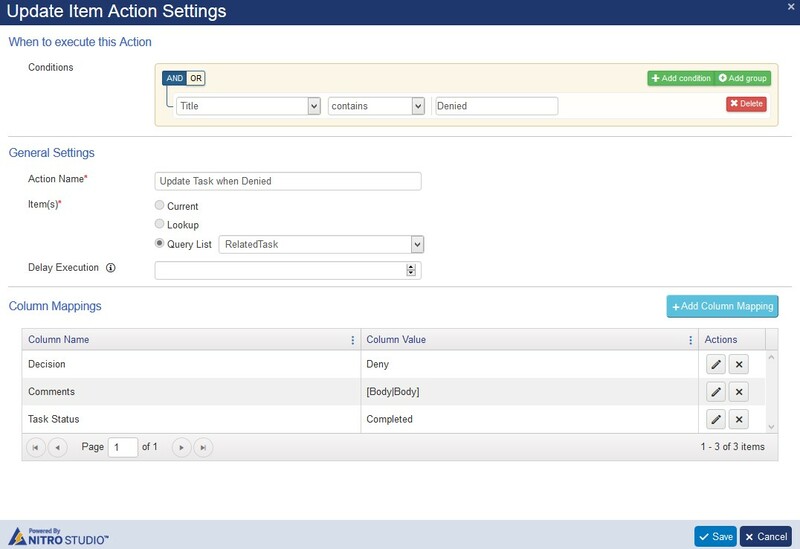 Please refer https://www.crowcanyon.help/article/299/ for sample configurations and reconfigure the approval feature using NITRO Workflow Manager before proceeding with the configurations described in this article. This article describe the process to configure NITRO workflows such that approver can make the decision directly from the mail instead of going to task edit form (no login required). Idea is, we include the hyperlinks (one for each possible decision like Approve/Deny/etc.) in the approver mail body that opens a new email with pre-filled subject and recipient so approver can click on the desired decision link and click send to confirm the decision. Pre-requisites: This article assumes that the approver feature is already configured as described in the Description above. Any main list like Tickets/Purchase Requests/etc. 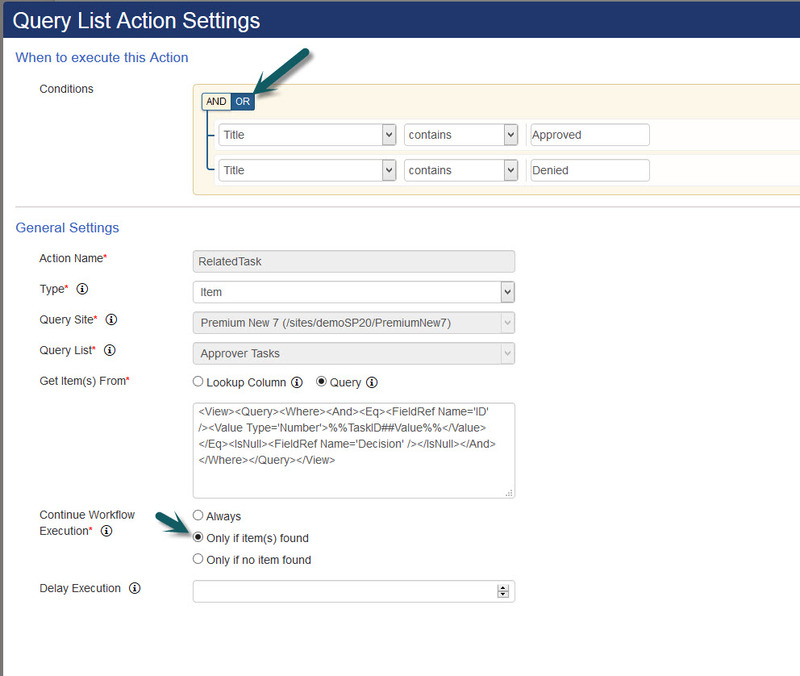 To support approve via email feature, we need to create certain lists and fields as described in this section. This list will be used in Crow Canyon Email Sync settings and will be used in approver mail template, so when approver click on the decision link and send mail, email reaches to this list and it will be processed further by Crow Canyon NITRO Workflows app. 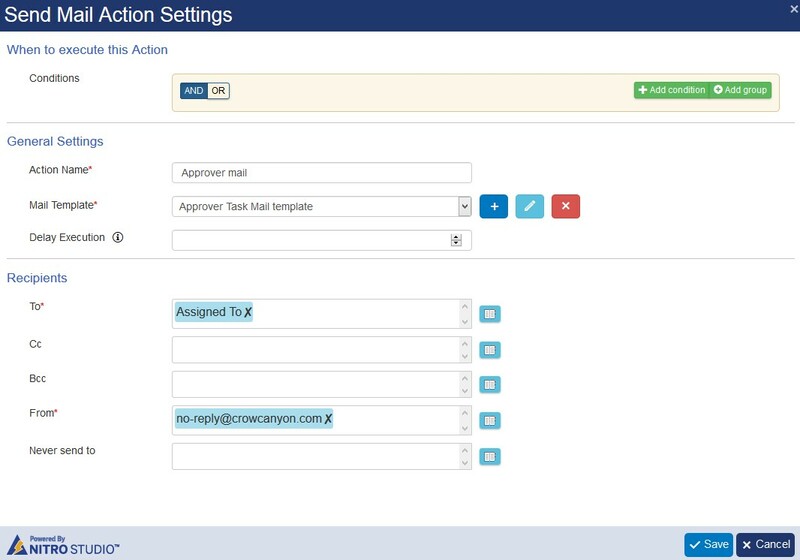 Configure Email Sync settings using Crow Canyon Email Sync app on “Approver Emails” list as shown below. Pre-requisite is to have a valid mailbox that can be accessed using on-premises or online exchange web services. Please refer “https://www.crowcanyon.info/nitro/appmanual_v2/index.html?configuring-email-sync.html” for Email Sync App complete manual. 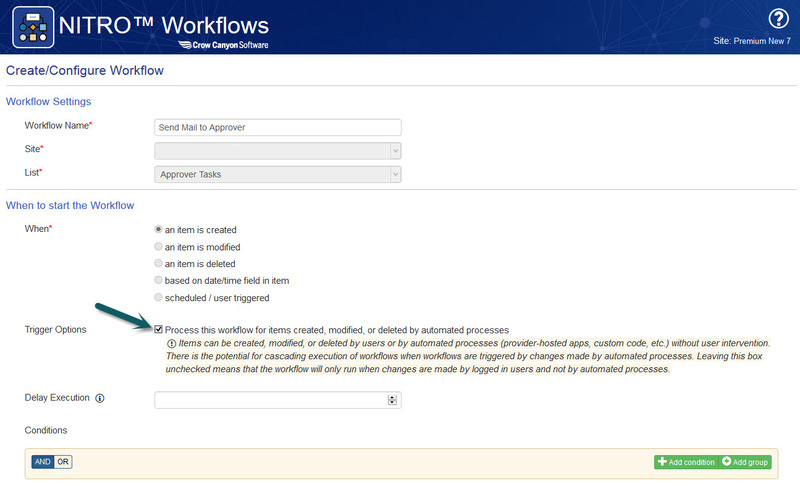 Workflow1: Create a workflow on Approver Tasks list “on item created” event as showed in below screenshot. 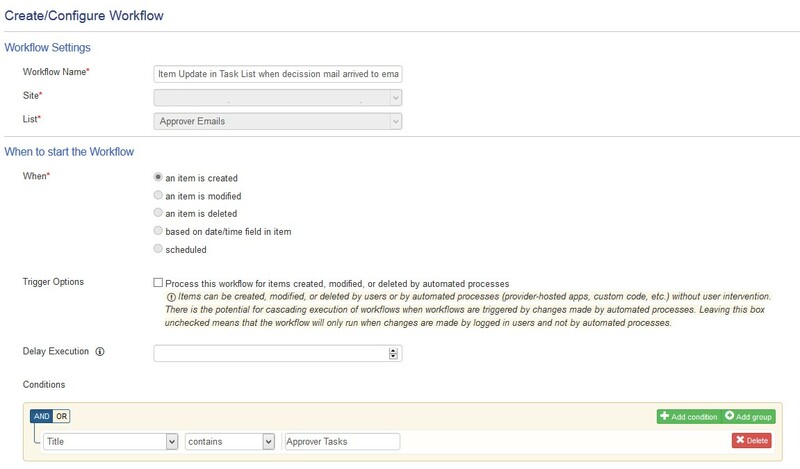 Note: If there is already an existing workflow with “Send Mail” action on “Approver Tasks” list item creation event, modify the existing send mail action and reconfigure the mail template as described below, otherwise create new workflow. The links can be configured as shown below. As per the configurations described in this article, it should follow the same syntax (List Name Key – ID – Decision Key). 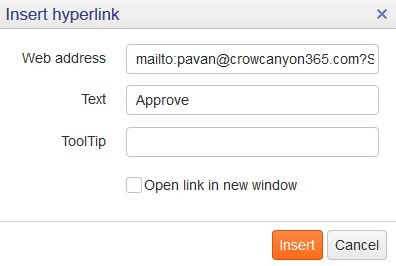 The email Address in the above syntax (email@domain.com) is the email account that is used in Email Sync settings in Crow Canyon Email Sync app in above steps. 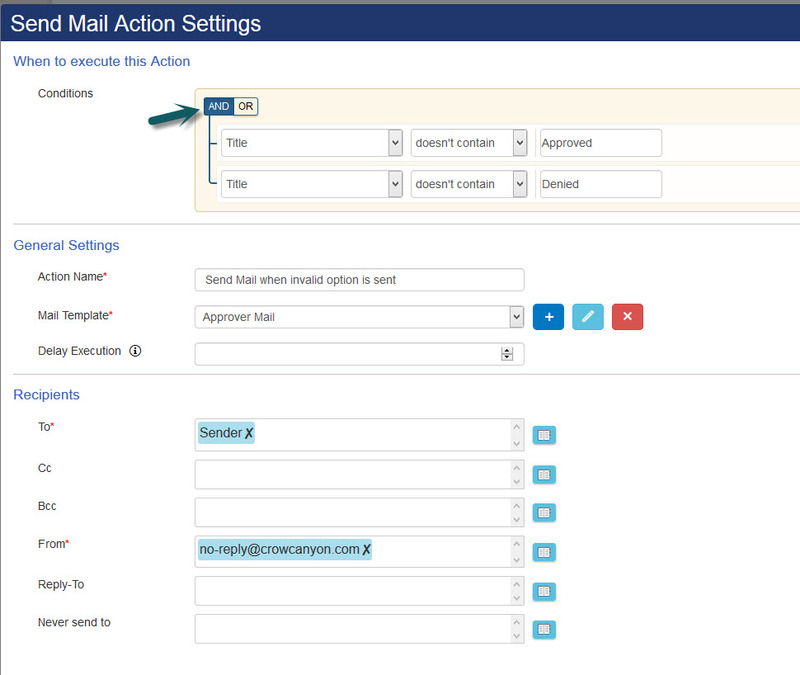 Action1: Configure a “WF Variable” action to find the approver task ID from the mail subject. 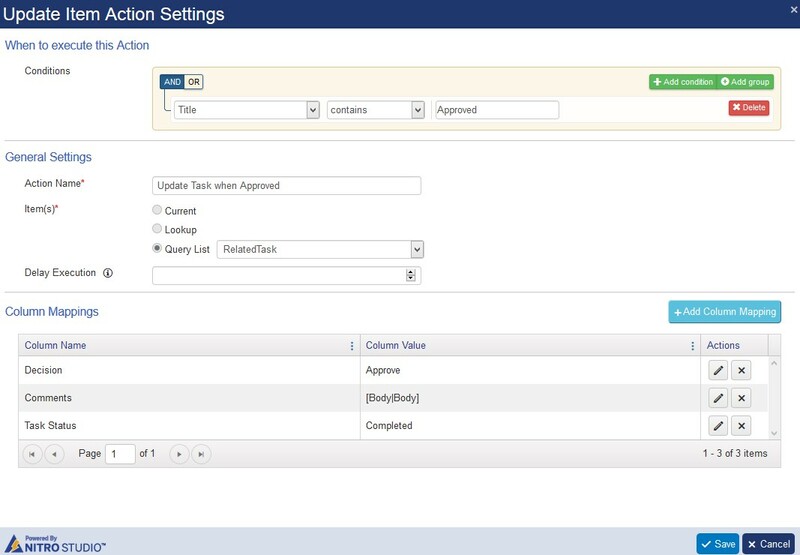 Action3: Configure a “Query List” action to get the corresponding approver task from the “Approver Tasks” list and see whether the task is already completed or not. Further actions will be executed only if the approver task is not already completed. See screenshot below. 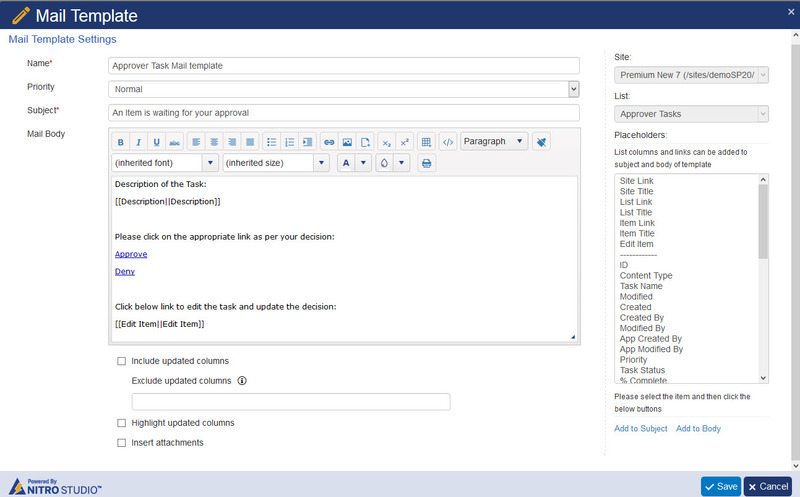 Action4: Configure an “Update Item” action to set the approver decision as “Approve” as shown below. 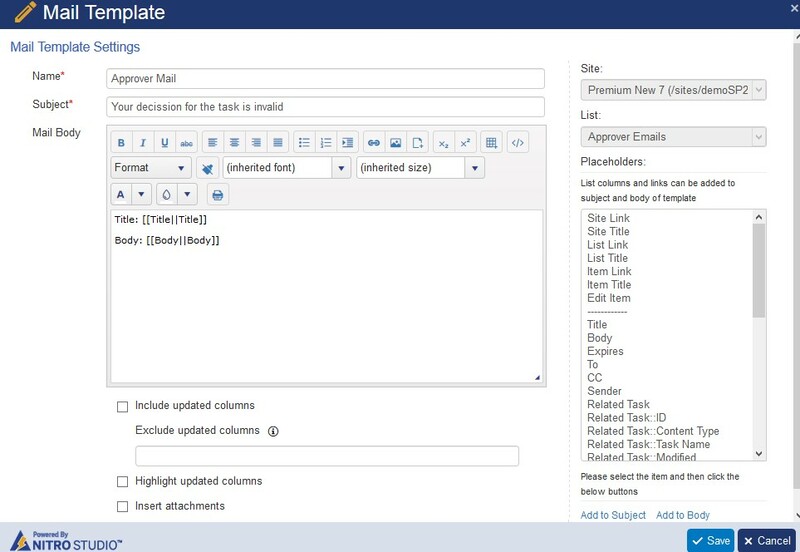 Note: In complex cases where there are multiple approver tasks lists exist, we can use the same email address in Crow Canyon Email Sync settings, however, create new workflow on Approver Emails list with different conditions as needed and configure workflows on the other approver tasks list as well with appropriate mail templates.